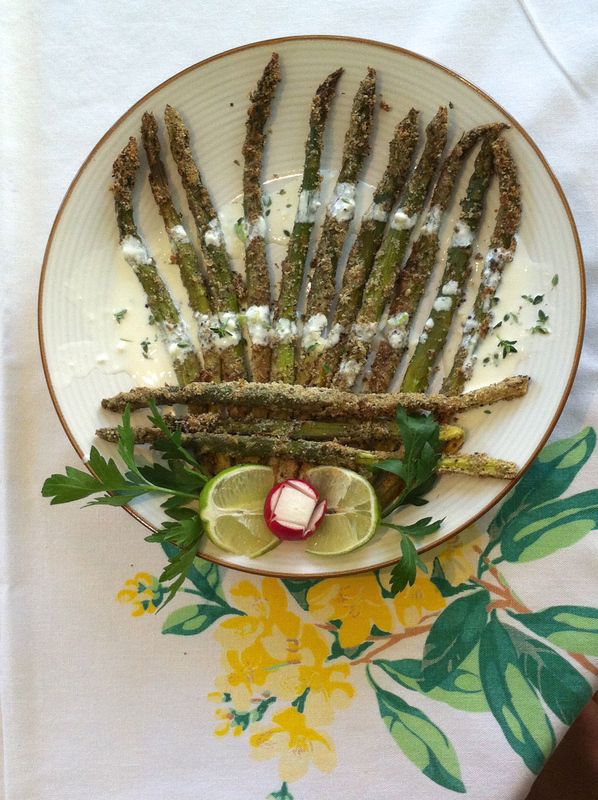 Crispy Asparagus are coated in ground pumpkin seeds and spices! Rinse, trim the bottom ½” and remove the skin from the lower third of each asparagus spear with a vegetable peeler. Evenly coat a baking sheet with 1 tablespoon of oil and place in an oven set to 350º. Grind the pumpkin seeds into a fine powder in a coffee grinder. (Add coriander and fennel here, if spices are whole seeds.) Pour ground pumpkin seeds and the remaining spices into a rectangular baking dish at least as long as an asparagus spear and tap it to one of the longer sides. Roll each spear in the pumpkin seed and spice mixture and reserve at the empty side of the dish. When all the spears are evenly coated, place them on the hot baking sheet and roast for 15 minutes before turning over each spear. Continue to bake for 10-15 more minutes or until the asparagus is tender and the coating is golden brown. Zest ½ a lime in to a cup and stir in lime juice and mayo until smooth. 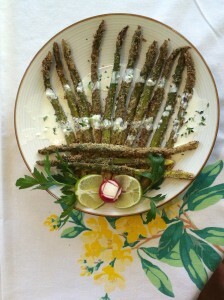 Arrange the asparagus in a serving plate and pour a thin stream of the limo-mayo sauce over it. Sprinkle the white sauce decoratively with fresh thyme leaves and garnishes before serving. Tip: For once, fat is better than thin! Thin asparagus spears aren’t more tender than the big fat ones. It’s the insoluble fiber in asparagus’ skin that’s the tough part and overcooking it just makes it stringy and bitter,not more tender. Preferred are asparagus with a larger circumference. Then the ratio of tender soluble fiber beneath the skin is higher for a more chewable, flavorful experience. So go for the big ones!